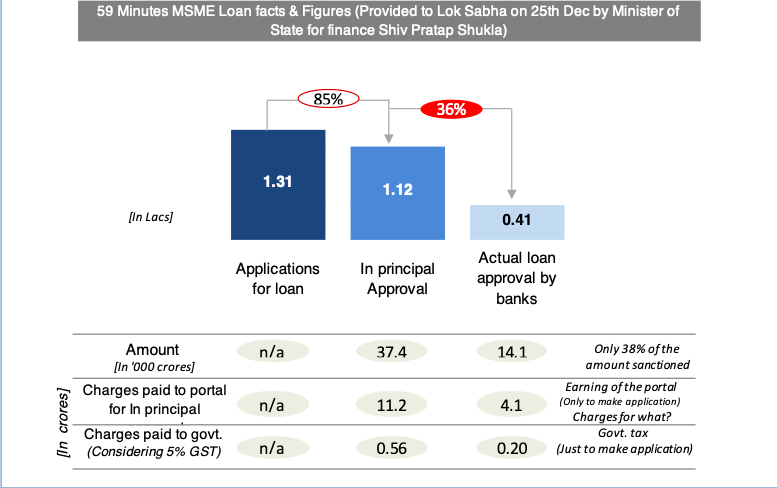 On December 25, 2108, Minister of State for finance informed the Lok Sabha that out of total 1.31 lakh loan applications received on the newly launched 59 minutes loan, 1.12 lakh applicants received the in-principle approval and out of these in-principle approved loan applications, 0.41 lakhs have finally received the loans. Although it is clear that an unknown firm had been tasked to operate this portal without actually qualifying for even a single tender condition, it should also be noted that later on, SIDBI purchased the majority rights by paying a premium to this company, Capitaworld private limited (now called as Online PSB Loans limited, a subsidiary of Capitaworld global platform limited). Now, it should be noted that you will not find the name of this company anywhere on the home page of this website. On the home page only the SIDBI is displayed (May mislead users that government-owned organisation is running this website). Further, it was claimed that there will be no human intervention until the loan is disbursed. However, this website only gives in-principal approval and later on, the applicant has to visit the branch and provide all the documents (normal loan procedure) and follow existing loan procedure. So, whether this portal is launched only to tell that you go to so and so branch which may or may not give you loan (and for this, applicant will be charged INR 1,000. + Tax, this charge is not returnable even if loan is not sanctioned by the branch) or this does complex probability and find out that which branch can accept these many documents (These documents are all same across all applicants). Furthermore, the company also charges the bank on the total amount sanctioned (0.35% of sanctioned loan amount). This amount has not been disclosed by the minister during the reply. The government made at least INR 0.56 crore in this approval process. If we consider the loans actually sanctioned then the company has made an extra INR 7.1 crores and government INR 0.36 crores. I am not sure if the government and company are returning this amount to the already suffering MSME applicants or not!